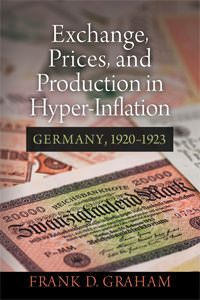 This large-scale study of the German hyper-inflation is definitive in the English language. Written by a professor at Princeton University, and published in 1930, Frank Graham's treatment was so accurate and incisive that Ludwig von Mises himself recommended it time and again. It's contribution is to explain the plight and fate of business under one of the 20th century's most egregious inflations. The book begins with clarity about cause and effect. "Germany, in common with other warring countries, departed from the gold standard at the outbreak of hostilities in 1914. On November 20, 1923, the German paper mark, after having fallen to an infinitesimal fraction of its former value, was made redeemable in the newly introduced rentenmark at a trillion to one." Further: "In 1913 the mark was solidly based on gold; in 1923 its value was, as one writer has said, something more ridiculous than zero." An economic historian who understands the relationship between fiat money and inflation is prepared to write a great history, and Graham does that here. The economics of this book are rock solid. He places strong emphasis on the strange behavior of business enterprises under hyperinflation. One might expect that business leaders would decry that inflationary path. The opposite is true. "Many of the leaders of business were convinced that inflation was necessary to the rehabilitation of the German industrial organization; that only through a falling exchange value of the mark could essential foreign markets be regained; that the business profits which it promised, and indeed produced, were a prerequisite to the restoration of a sound peacetime economy." The narrative history here is deeply scientific, covering the economic history blow by blow. He covers the wartime background, the political factors that led to the inflationary choice, the regulation of business under inflation, price controls and their enforcement, the measurement of inflation, the effects on production, the devastation of national income, the gutting of genuine entrepreneurship, the losses on foreign trade, the surprising winners from the wholesale looting, among many other considerations. He comes to terms with a very strange paradox: business was booming during the inflation as never before. Bankruptcies were actually falling and new businesses were forming everywhere. And yet, looked at as a whole, the entire economic structure was being wiped out. Professor Graham discusses the details of this strange paradox and shows how inflation creates such an upsidedown world that the distinction between reality and illusion gets lost. Trading, speculation, working, and economic activity in general might be up, but productivity, income, and economic well being was being destroyed in the process. The activity was entirely diverted from production and wealth creation to consumption and speculation. He provides a very close examination of the turning point of the crisis, when the seeming economic activity turned from hyper-boom to calamity. In particularly, he focuses on the point at which workers began to realize that their wages were not going up but dramatically down in real terms, and began to dump the currency, demanding payment in foreign currencies or goods. The inability of entrepreneurs to function came suddenly. at the very time that new or additional fortunes of staggering magnitude were being accumulated. The old middle class wellnigh disappeared and a new group came into prominence. There was less change in the condition of the masses—they had not so much to lose—but the wiping out of savings, insurance, and pensions pressed heavily upon the worker even if his losses did not parallel those of some of the better-todo social classes." He further assesses the motivation for inflation as it stemmed from the astonishing burden that the Allied powers placed on Germany in the form for reparations for World War I. In this sense, he says, and only in this sense, can the inflation be seen to have benefited the country. It permitted them to get out from under their reparations debt. But the political implications were yet to be revealed by the time this book went to print in 1930. Professor Graham ends on an ominous note that the main mystery yet to be decided concerns what the politics of the situation has in store. He calls this aspect "an inscrutable mystery." The mystery to be revealed in time was of course the rise of Hitler.